Muslim Aid has launched an emergency appeal to raise £500,000 for survivors of the Pakistan earthquake which struck on the 29th October 2008. At least 300 people have been killed after an earthquake of 6.4 magnitude hit the Balochistan province in south-western Pakistan. Since then there have been several hundred tremors meaning thousands more will have lost their homes and the death toll is expected to rise. With a strong base in Karachi, Pakistan, Muslim Aid has been assessing the extent of damage and is beginning to deliver emergency relief to some of the 35,000 families affected by the disaster. Over 15,000 people have been left homeless. 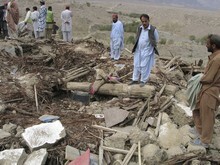 The worst-hit area is the district of Ziarat, about 50km north of Quetta, where over 1,000 mostly mud and timber houses were destroyed in five villages- War Choom, Kawas, Wam, Kan Depot and Serkhazee. A team of Muslim Aid volunteers are already on the ground assessing the situation. 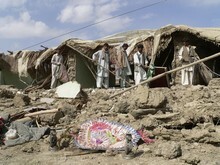 In addition, a team of four people from the Muslim Aid Pakistan field office in Karachi have reached the affected area. Muslim Aid Pakistan will dispatch 100 tents, which are currently in Islamabad, to the affected area. They are also planning to purchase a further 500 tents. A medical team will also be mobilised to administer emergency treatment. People are in urgent need of tents, warm clothing, blankets, wood for fires, medicines and canned and dry food. Women and children are particularly vulnerable to the cold nights. EMERGENCY APPEAL. DONATE NOW.DONATE NOW.DONATE NOW.